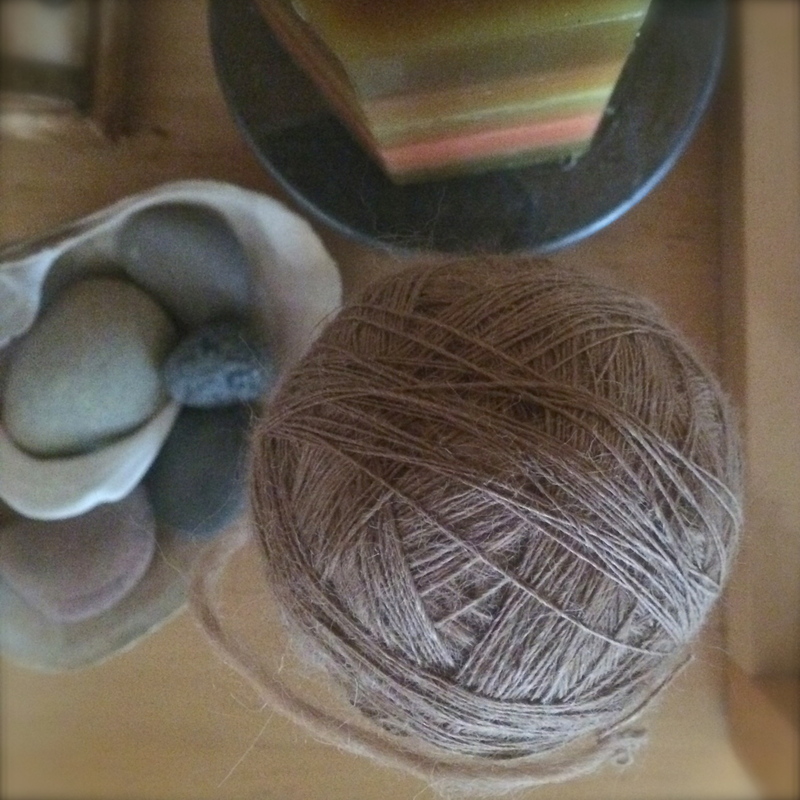 I love spinning, and took up spinning pretty quickly after I started knitting. This is the first time I’ve ever spun enough yarn for a sweater though. And while, I probably won’t turn into a knitter who knits exclusively with handspun yarn, going from fiber -> yarn -> sweater was pretty damn amazing. This is a sweater knit entirely out of handspun yarn. 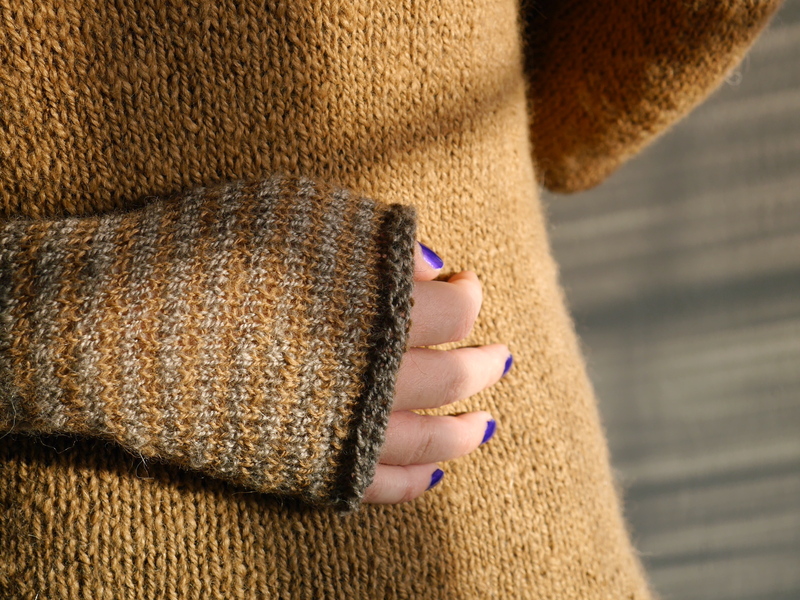 Yesterday I wrote about the process of spinning the yarn, now details about the sweater itself. All the yarn are super basic two ply yarns – the lace weights are much more even than the worsted weight, mostly because I’m more comfortable spinning lace weights, but also because the worsted weight was my first experience spinning on a Hansen miniSpinner (it was amazing). 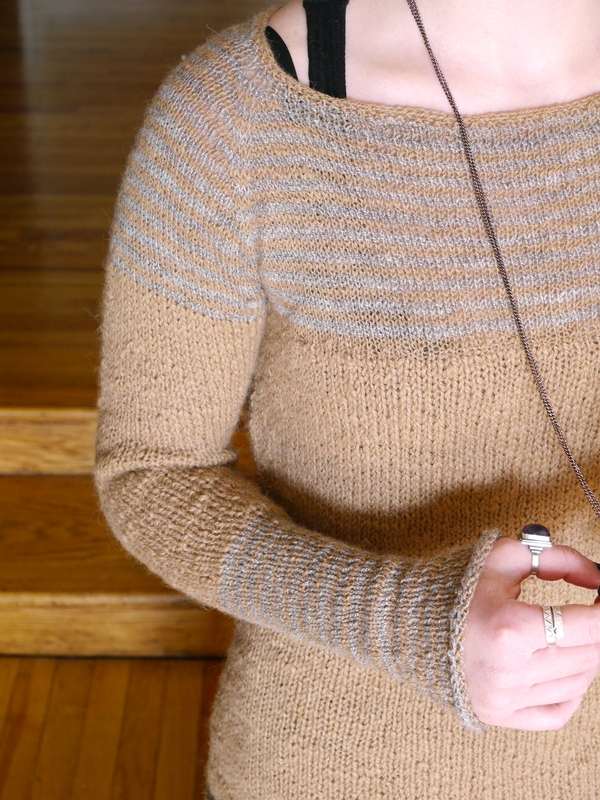 A basic top down raglan pullover, with short row shaping at the back of the neck, to help keep the neckline from pulling up. I striped the two lace weight for the yoke, the bottom half of the sleeves, and a bit around the bottom hem. 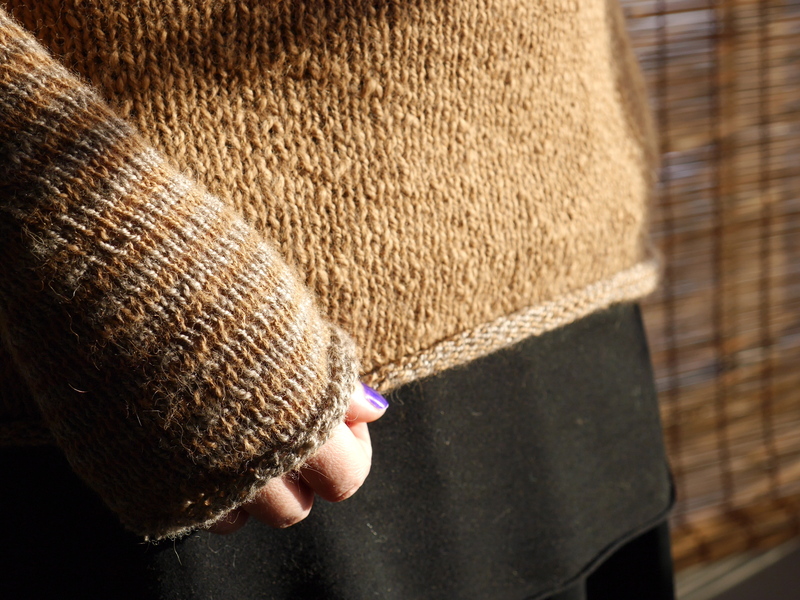 Then I used the worsted for the main body, and the sleeves. I wanted a pattern that was simple enough to let the yarn shine, and was flexible enough that if I started running out of yarn I had options. I just had enough yarn, and I loved knitting an entire sweater out of handspun yarn, though I can’t say it’s something I’d do all the time. Grace does it a lot – and I don’t know how she does it. This is the first sweater I’ve finished that includes short row shaping for the back of the neck, and I have to say I really like it – I’m playing around with it in the purple yoked sweater I’m currently working on, and it’s probably a feature I’ll be adding it to most of my future sweaters. I’m not sure I’d do anything differently per say, but this is the third top down raglan sweater I’ve finished and I don’t love all of the excess material it produces at the underarm. That material under the yarn ends up bunching weirdly – which I’m not a fan of. So, I think I’ll lay off the raglan shaping for awhile and explore other types of sweater yoke shaping. 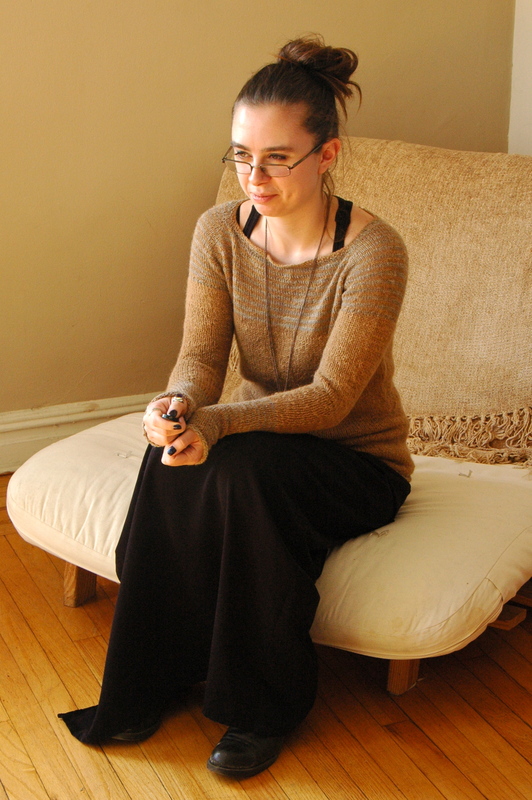 I really, really love yoked sweaters (like my boring black sweater & handknit sweater dress), and I want to try some more sweaters with set in sleeves (the Moonstruck Cardigan had sewn in set-in sleeves, and my Versio sweater had seamless set-in sleeves). I’m interested in experimenting some more with seamless set in sleeves – Andi Satterlund’s guide to seamless set-in sleeve sweaters looks interesting. congrats! it looks amazing and warm. 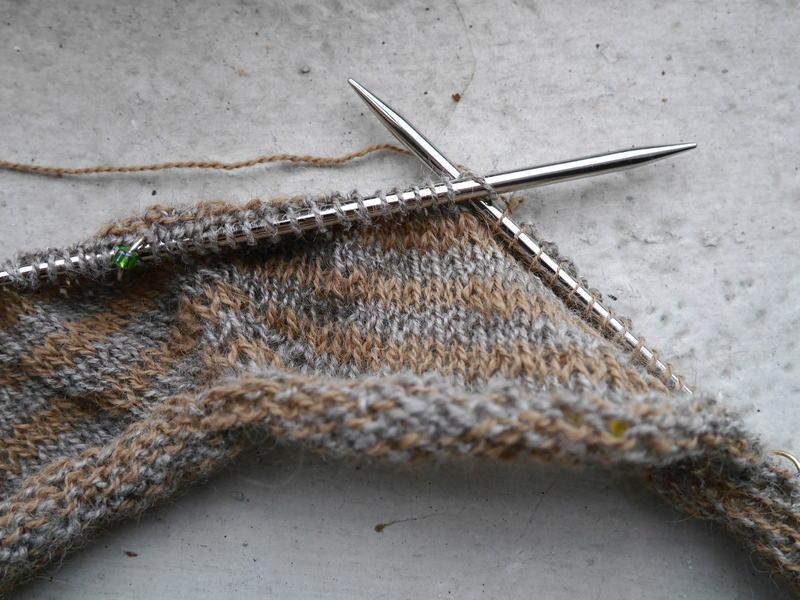 i also like Barbara Walker’s knitting from the top for seamless set-in sleeves. It is really warm! Thanks for the seamless set-in sleeves tip – I’ll definitely look into it. Looks awesome! I like the way you used different weights of yarn. I’m not clear on what short row shaping is supposed to do for the back of the neck? Thanks Alicia! The short row shaping at the back of the neck, makes the back of the sweater slightly taller than the front, which helps keep the front of the neck from pulling up as you wear it. Does that make sense? 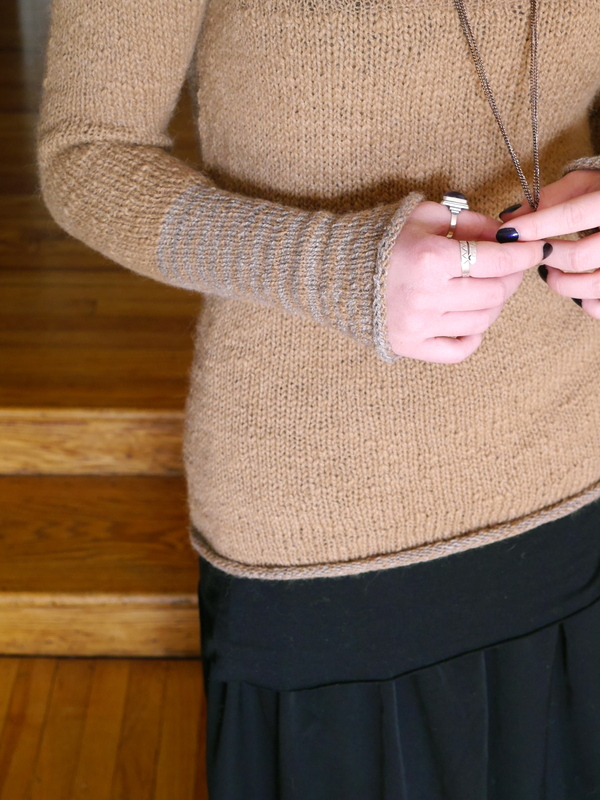 On this sweater I kept the shaping really subtle and only worked an inch or two of short rows. That’s amazing, Holly! I love the natural colors. Looks warm and comfy. Thanks! It is wonderfully warm. 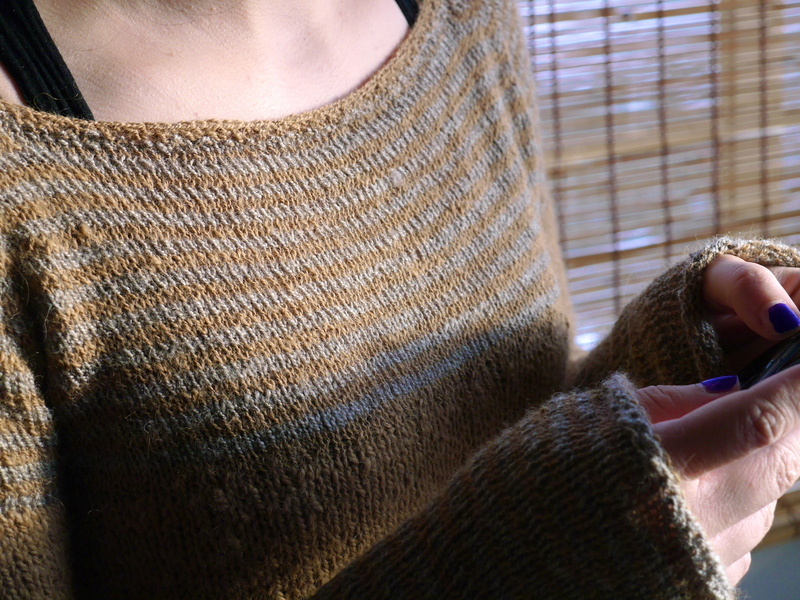 Congrats on finsihing a handspun sweater. I love evyerthing about it, pattern, colour and of course the beautiful yarn! Thanks Tahnee! I love it too!